On an ugly, rainy day in Athens, Ohio, it was only fitting that the deciding plays came on the defensive end. 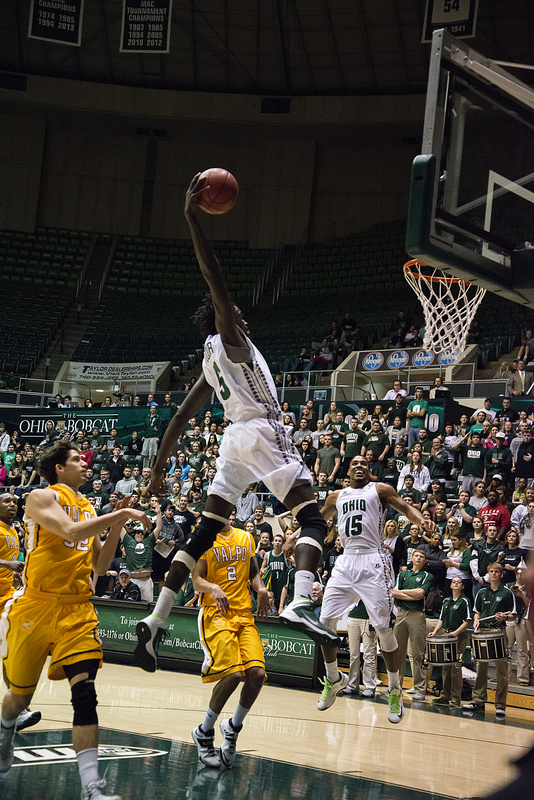 With 11 seconds remaining, Maurice Ndour’s monster block and Ricardo Johnson’s long rebound on the following play preserved a 76-72 victory for the Ohio Bobcats over Valparaiso. Though Ohio consistently led by 10 or more into the second half, Valparaiso was able to mount a comeback that came up just short. Ohio built their early lead through lights-out shooting. Nick Kellogg hit two early three-pointers, and T.J. Hall added one of his own to give Ohio 20-8 lead with 15 minutes remaining in the first half. Ndour was also on fire to begin the game. Through five minutes, the 6’9” junior had nine points, including a three pointer and a monstrous slam-dunk. “I just go out there and play for the team and do whatever I can for the team,” said Ndour. Early on, Ohio’s front court did a terrific job of keeping the much bigger Valparaiso forwards out of the paint and preventing them from getting easy buckets. However, Ohio’s offensive pace began to slow as the second half began. Ohio would go 20 minutes between three point field goals, and the Crusaders began the second half on an 8-0 run. “In the second half, defensively, I thought it might have been the worst we’ve played all season,” said Christian. The Crusader’s run was highlighted by a huge dunk by Crusader big man Moussa Gueye, who went through Ndour for two and the foul. It was one of three straight “and ones” by Valparaiso. Just as they did Tuesday against Ohio State, the Bobcats found themselves in foul trouble for much of the second half. With 13 minutes remaining, Valparaiso was already in the bonus. With the likes of Hall and Ndour in foul trouble, Ohio found a spark in role players Treg Setty and Antonio Campbell. “Everyone who’s stepped on the floor for us this year has played hard,” said Christian. “Each guy made some plays and had some stretches where it helped. Campbell would score his first basket as a Bobcat, a crucial put-back and foul that inspired Ohio to take a 16-point lead with just under 10 minutes to play. But the Bobcats would see their lead quickly melt away as the second half came to a close. In the span of two minutes, the Crusaders would mount a 10-0 run and take a one-point lead with two minutes to play. Forward Alec Peters led the way for the Crusaders, scoring five of his 16 points during the frantic comeback. But when the game was at odds, Ohio was able to hit foul shots and Valparaiso couldn’t put the ball in the hoop. Foul shots from Hall and Johnson, as well the key defensive plays down the stretch iced the game for the Bobcats. Maurice Ndour led the way for the Bobcats, finishing with 23 points, six rebounds five blocks and four steals. Nick Kellogg added 16 points with four three-pointers, and Jon Smith led the Bobcats with seven rebounds. For the Crusaders, LaVonte Dority totaled 20 points and Jordan Coleman added 11. Peters led the way with 13 rebounds. Ohio’s next test will come Wednesday at Morgan State. Tipoff is scheduled for 7:30 p.m. in Baltimore, Maryland.